Wine is a phenomenon that in a sense is largely supported by the constant dialogue that surrounds it. Of course this dialogue is helped by the fact that wine tends to loosen one’s tongue and also by the fact that a sound knowledge in wine is believed to imbue the speaker with status. However, much of the dialogue that surrounds in wine appears to exist to genuinely further the enjoyment of wine. So much is this the case, in fact, that the huge wine lovers print industry, along with the plethora of online wine sources point very clearly to wine being something far beyond just a drink. Wine is an institution and a myth supported partly by the words that are spun around it. Wine is essentially a social phenomenon, with communication at its centre. The complex and sometimes unusual use of words to describe wines can be off putting to many people who wish to express their feelings about wine, especially in the presence of more experienced wine drinkers/tasters. However, as with many fields of expertise only those with inferior knowledge will attempt to belittle your efforts so long as you express yourself honestly and openly. Body: The viscosity of a wine. Texture/Mouth feel: The sensation a wine leaves in your mouth. Flavour: Flavour is the element that really gets people talking, and is the element that induces the most bizarre use of language. Flavour is closely related to aroma – these two senses being ultimately inter-dependent. So, the body may be full bodied like Marilyn Monroe, the texture may be smooth, and the flavour/aroma may evoke blackberry and animal manure! The myriad of flavours and other combined elements naturally call for highly imaginative descriptions. For this reason, never be shy of using a seemingly absurd comparison when describing wine – if anything it will demonstrate confidence, so long as it bears some relation to the character of the wine! Tannic: tannic denotes the level of ‘tannin’ in a wine. Tannin gives a bitter yet earthy taste and can be detected in tea as well as in red wine. It is a desirable taste in moderation but can leave an over-bitter taste in large quantities. 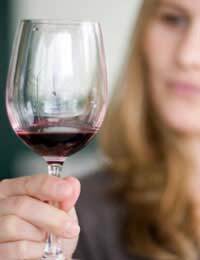 Wines high in tannin cause the mouth to ‘pucker’, hence ‘pucker’ is a name used to describe wines. Buttery: Some wines have a buttery or creamy aroma due to high yeast contact during the production process. Oak: Oak can be tasted in wines that have been fermented in Oak barrels.These are standard terms that you would do well to note if trying to describe a wine to others. In addition to the terms used in describing a wine there a many further terms that relate to a wines origin, how well it has aged/been stored, and so on. These will be discussed in related articles.